Discussion in 'Aviation Passenger Security in the USA' started by Mike, Jul 1, 2011. To streamline the updating process, dates of updates have been removed from the page templates & file names. Check the beginning of each master list for it latest change data, and be sure to refresh your brower to ensure that you are looking at the latest version. Texas Public Utility Commission chairman Barry Smitherman: "You're punishing me for opting out, aren't you?" Can you send me an updated Word file every couple weeks? It's a bit of a process to get them converted to HTML, moved to the server & incorporated in the XF pages. Okay, Mike, will do. I'm barely competent at computer stuff, but I do update this doc every day. Will send you new version every few weeks. If you update it daily, maybe send it weekly, see if I can keep up. XF's internal counter is now is now showing > 2500 pageviews since 1 July. This is really just the # of times XF generated the page & doesn't include views that are fulfilled from browser cache. Will check Google Analytics later (should have accurate number). I installed an updated list from Lisa this morning. I just installed an update (7/16) from fisher1949. And thanks to TSA for doing their best to keep adding to this list. FetePerfection, barbell and Lisa Simeone like this. I noticed a substantial increase in size over the June edition. I've updated this with new lists from Lisa (7/22) & Bill (7/23). Finally got Bill's update from 1 August installed, probably just in time for his next update. A partial TSA crime map. Lot's of stars should be added, but we kept it small to start. Leave no trace, Fisher1949 and Lisa Simeone like this. It looks like all of the FlyerTalk links in both Master Lists are now broken. Holy (expletive deleted), Friendly Skies, that map is fab!! Only problem is if you tried to map every crime and assault that's been reported, it would be a sea of colors, illegible. There are just too many. But wow, it looks great. FriendlySkies and barbell like this. 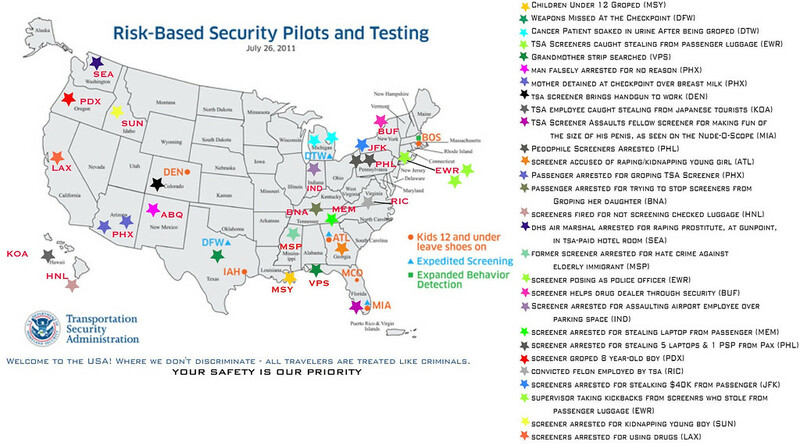 A partial TSA crime map. Lot's of stores should be added, but we kept it small to start. Did you do this or "steal" this? If the latter I would like to try to get permission to use it more visibly (with due credits, of course).